Hyperbole? If you’re visualizing an entire ocean, marshland, bay or miles-long beachfront destroyed, perhaps. But if you consider pelagic sargassum, that yellowish-brown seaweed that forms up into floating mats, clumps and weed lines (scientists call them “weedrows”), you will find entire habitats destroyed by the Gulf oil disaster. “It’s really a dynamic, diverse, spectacular open ocean community,” said Jim Franks, senior research scientist, Gulf Coast Research Laboratory (GCRL), Ocean Springs, Miss., about sargassum. “We’ve actually identified over 130 species of fish that utilize sargassum as habitat at one life stage or another,” he explained. From 2000 to 2004 a team of GCRL scientists, including Dr. Eric Hoffmayer, also of GCRL, and Franks, have studied sargassum. Team members made 14 sampling cruises in the north central Gulf of Mexico. They used large- and small-mesh nets to target juvenile fish and larvae, and collected samples by towing nets through, adjacent to and below sargassum to a depth of 50 meters. The final tally of fish that used sargassum as habitat during the sampling cruises came to 110 species, a slight under count because 19 fish could be ranked only by family, not by genus and species. It’s interesting to note that these surveys specifically targeted juvenile and larval fish. 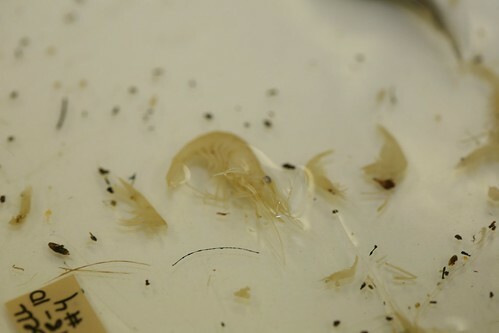 Other animals were collected but no crabs, shrimp or other animals that depend on sargassum were counted. 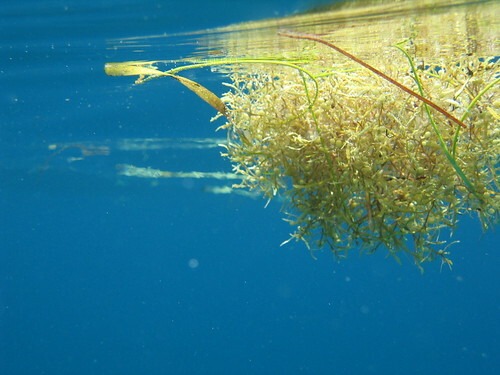 A less scientific, but perhaps equally enlightening experience is to jump into the water near a sargassum mat or, as our lawyers would prefer I recommend, view the habitat from a boat. You’re likely to see filefish, jacks, blue runners, flyingfish and triggerfish. A few feet deeper swim sharks, dolphin (of the mahi-mahi variety), barracuda, wahoo and mackerel. You might see loggerhead, Kemp’s Ridley, green and hawksbill sea turtle hatchlings. Hanging on to the sargassum might be sea snails. In the sky, watch for the masked booby, red-necked phalarope and various terns and gulls. The bridled tern often rests on top of the clumps of sargassum. Sargassum is habitat. And a lot of it was wiped out by oil, dispersant and burning. What no one can tell me is how much animal and plant life was destroyed either by oil, chemicals or fire. “I saw a considerable amount of sargassum that was actually in the oil and in the dispersed oil and in the oil sheens,” said Franks. “We saw a lot of that in our offshore cruise in May. At that point we were about 80 miles south and looping around to 80 miles north of the actual spill site, so we were some distance away,” he added. Asked how many fish, shrimp or crab larvae or juveniles were killed in oiled sargassum Franks said, “There’s no way to tell for sure. It’s something we plan to investigate,” he added. And therein lies the rub. There are very good measurements of very small pieces of the puzzle. After that, it’s a matter of mathematical models, extrapolations and guesswork. Take turtles, for instance. We know that several species of hatchling sea turtles make their way to sargassum mats and live the early part of their lives within those weeds. So how much oil hit how much sargassum? How many of each turtle species were there when the oil hit? What were the effects of the oil on sargassum and baby turtles? How many turtles were harmed or killed and how many made it through ok? A 2008 study by the Florida Fish and Wildlife Research Institute surveyed sargassum habitats for neonate (i.e., hatchling) sea turtles. The study found 60 sea turtles per square kilometer of sargassum habitat (30 green turtles and 30 Kemp’s Ridleys) in one survey area off Pensacola, the smallest of six survey areas around Florida (four in the Gulf, two in the Atlantic). So all you have to do is figure out how much sargassum is out there, and how much of it was hit by oil and chemical dispersants, and you can generate at least an estimate of the number of baby green and Kemp’s Ridley sea turtles that were impacted by the Gulf oil disaster — maybe even stretch to say “harmed” by oil and chemicals. That’s what the Natural Resource Damage Assessment (NRDA) is trying to figure out. And it’s not just about the nature. It’s about money — fines and penalties and lawsuits. Which means the lawyers should do just fine. But the sargassum is gone — destroyed and sunk to the Gulf floor. And with it, the habitat for baby sea turtles and a myriad of other marine newborns.